Below is this history of Maryland Sports, starting with the transition report in 2008 stating the there is a "need to focus on sports", to hiring an Executive Director, to the rebranding of "Maryland Office of Sports Marketing" to Maryland Sports- The Sports Commission for the State of Maryland. You may either scroll through the years or click on the year you want to view below. Fiscal year 2018 has been nothing short of rewarding. Throughout the course of the year, Maryland Sports has been extremely active with the community statewide. In FY18, we had 15 TEAM Maryland partners, welcoming Talbot and St. Mary’s county to the team. Maryland Sports launched a new website specifically for its 15 TEAM Maryland partners, TEAMMaryland.us. Maryland Sports staff worked extremely hard to make sure our grant program would not get cut during the legislative session, ensuring that we will have the funds to help our TEAM Maryland and Maryland’s Own partners create and sustain successful and memorable events. 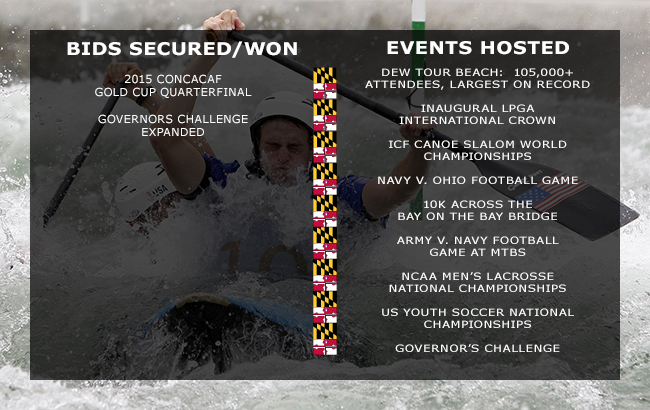 Maryland Sports attended several conferences, such as NASC’s 4S Summit, TEAMS, US Sports Congress, SFIA and NASC. 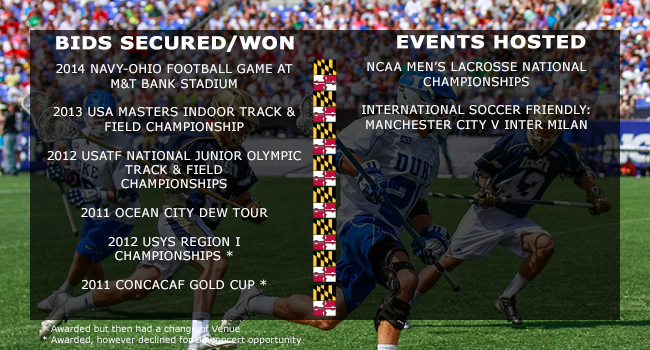 Maryland Sports also sponsored other events throughout the fiscal year, such as IRONMAN Maryland, Across the Bay 10K, Fair Hill Races, US Lacrosse’s LaxCon, The Basketball Tournament (TBT), TEDxCollegePark and others. For its first time ever, Maryland Sports hosted its own locally organized event at the US Naval Academy in March of 2018, the Maryland Sports Spelling Bee. We created this event to give kids throughout several counties in Maryland that did not have the chance to compete in a regional spelling bee to compete in the Maryland Sports Spelling Bee. Our Bee was a qualifier for the Scripps National Spelling Bee in National Harbor, MD. In June of 2018, the United Bid of Canada, Mexico, and the United States was selected to host the 2026 FIFA World Cup™ by the 68th FIFA Congress in Moscow. For the first time in history, FIFA’s Member Associations were given the opportunity to vote on the host for the FIFA World Cup™. They did so by a vote of 67% (134-65) majority by 203 members. Baltimore is one of 23 cities that has the opportunity to host matches. FIFA will choose 16 of the 23 cities in late 2020. We have created several advertisements that have been shown throughout numerous platforms, such as PressBox, Sports Destination Management, Destination MD, SportsEvents, US Lacrosse, Fair Hill Foundation, Sports Planning Guide and CBS Baltimore. Overall, FY18 was a busy, yet successful year for Maryland Sports and we are looking forward for what’s to come in FY19. Fiscal Year 2017 was a monumental year for Maryland Sports and its staff. Terry Hasseltine, Executive Director of Maryland’s Sports Commission, was recognized in front of his peers at the National Association of Sports Commissions (NASC) in Sacramento to be awarded the NASC Sport Tourism Executive of the Year. HB1619 was signed into law in May 2017, which was approved unanimously by both House and Senate. Maryland Sports was named Tourism Partner of the Year by Wicomico County. We also created several ads placed in Sports Business Journal, Sports Planning Guide, Sports Destination Management and more. Maryland Sports touched over 320 events, generating over $181.4 million in direct spending on Maryland’s economy. We had 14 TEAM Maryland partners who generated 87% of our total direct spending across the state. Throughout the year, Maryland Sports, along with Visit Baltimore, made the shortlist for the 2026 FIFA™ World Cup. Fair Hill, a prestigious equestrian center in Cecil County, was recommended as the site for an international CCI4* event. We also traveled to Lexington, KY to witness and gather insight on best practices associated with the Rolex Kentucky CCI4* event and learn what we can do to enhance the event when it comes to Maryland. In May, USA Cycling announced that the 2018 and 2019 USA Cycling Amateur Road National Championships was awarded to Hagerstown and Washington County, which will take place in July. s Marketplace/Olympic SportsLink, NASC Symposium and US Sports Conference during 2016. 2016 was an important year for Maryland’s Sports Commission. Maryland and Baltimore City hosted both the US Lacrosse Convention and the NSCAA Convention in January 2016. March was the month of women’s basketball in Maryland. The CAA Women’s Basketball Championship was held at the Show Place Arena in Prince George’s County, including the best teams from around the CAA in a single elimination tournament. Shortly after the first and seconds rounds of the NCAA Division I women’s basketball tournament were held at the University of Maryland’s Xfinity Center. Other major events throughout 2016 included the Big 10 Men’s lacrosse Championships, EAGLEMAN Maryland, IRON Girl Triathlon, Bassmaster Elite, Naptown Challenge, USSSA Eastern World Series and several others. Maryland Sports created an Instagram account (@MarylandSportsCommission), now managing six different social media platforms. MAASA, or the Mid-Atlantic Amateur Sports Alliance, was awarded Tourism Partner of the Year by the Maryland Tourism Coalition. The Governor's Challenge in Wicomico County winning an award by the National Association of Sports Commissions (NASC) Locally Created Event of the Year. In 2015, our first calendar year being newly branded “Maryland Sports” and as TEAM Maryland, we helped create a significant growth in the sports event and tourism industry. We supported over 310 events in 24 counties in 45 different sports. Between January and March alone, we touched over 40 events in 12 different counties. In January, Maryland Sports assisted US Lacrosse in holding its annual convention, which saw direct business sales finish around $2.2 million, which included over 7,000 attendees. The Convention was comprised of around 150 educational sessions for coaches and officials, the Sports Medicine Symposium and the 2015 MLL Draft. TEAM Maryland partner and Maryland’s only beach town, Ocean City played host to many successful events including the Mite Beach Bash in February. The youth hockey tournament is held in the Carousel Resort Hotel, where one of the most unique tournaments and ice rinks lies. The tournament was so successful; the hotel now holds at least one tournament there monthly. In March, Maryland Sports partner Prince George’s county held their fair share of women’s March Madness events the CAA Women’s Basketball Tournament, which influenced over $750,000 of direct spending. PG County also held a part in hosting rounds 1&2 for the Women’s NCAA Basketball Tournament. In April, TEAM Maryland partner Baltimore County held their 119th running of the Hunt Cup, where family and friends tailgate and picnic in the hillside that overlooks the 4 mile steeplechase course. At the end of April, TEAM Maryland supported partner Prince George’s County ad University of Maryland as they hosted the inaugural Big 10 Lacrosse Tournament weekend. In the beginning of May, the 14th annual Frederick Running Festival took place, which featured 2 person relays, half-marathons, and also a Kid’s Fun Run. Howard County and Maryland Sports helped the 2015 SAC Invitational Memorial Day Tournament reach $7.2 million in direct spending. The USYS sanctioned tournament also generated an amazing 16,000 total room nights. On May 16, in Baltimore City, TEAM Maryland helped the 140th running of the Preakness, which featured the second victory of the soon to be Triple Crown winning horse American Pharoah. The following day the Navy-Marine Corps Memorial Stadium hosted the Division 1 Men’s Lacrosse Quarterfinals, where fans got to witness the eventual National Runner-Up: University of Maryland. 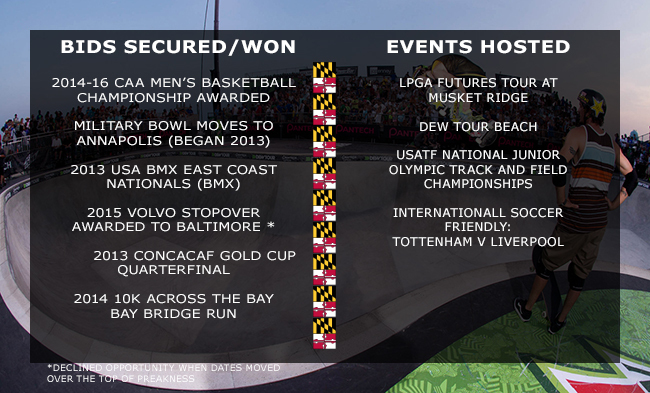 In June, Maryland Sports had an exceptional month as they helped execute two major events: The USA BMX East Coast Nationals and the Walmart FLW Tour. The 3 day BMX event, which took place in Anne Arundel County, generated $1.14 million in direct spending. There were more than 1,300 rider representing more than 20 different countries. Walmart FLW Tour event was also highly successful as the event produced over $500,000 in direct spending. The Charles County premier fishing tournament also generated over 1,100 total room nights. In early July, lacrosse hub Baltimore County hosted the 10th annual Under Armor All-American Lacrosse games for men and women. These two games feature the top 44 players from all around the country and is played at Towson University in Johnny Unitas Stadium. The following weekend most of these players high school teams faced-off in the National High School Lacrosse Showcase in Howard County, which is run by MIAA all-time great coach Bob Shriver. The tournament was won by local high school McDonogh, but the tournament made up of teams from 15 states across the nation. Later that month, the best youth baseball players in the world came to Aberdeen to play in the Cal Ripken World Series. This tournament caps a year long journey for 16 youth baseball teams, 10 of which won regional's in the United States and the other six being international teams. The youth baseball tournament provoked 2.3 million in direct spending. On the women’s side, the USSSA Eastern World Seriesof softball in Wicomico & Worcester Counties and Ocean City took place. The 3 week July tournament, for 5 different age groups. The busy month was capped by Maryland Sports bringing the 2015 CONCACAF Gold Cup quarterfinals to M&T Bank Stadium, where USA blanked Cuba 6-0 and Jamaica squeaked out a 1-0 victory Haiti. Fans from the four countries bought over 40,000 tickets and directly spent $3.5 million. In August, TEAM Maryland assisted Cecil County to a very successful weekend at the Chesapeake Bay in hosting Bassmasters Elite NorthEast. The fishing tournament attracted more than 25,000 fans and was filmed nationally by ESPN. The Savageman Triathlon 30.0 held in Maryland kicked off September as one of the most challenging triathlons in the world with a few of the portions featuring the mountains that surround the course. TEAM Maryland the assisted Baltimore County and GBMC hospital with the 15th annual Legacy Chase, which helps raise money for patient support programs. In the beginning of October, Maryland Sports supported one of the most unique triathlons in the country, Ironman Maryland. Hurricane Joaquin tried to stand in the way of the Ironman Maryland triathlon, but the competition was rescheduled and was a huge success. The competition see over 2,000 competitors endure a 2.4 mile swim in the Choptank River, a very unique 112 mile bike ride through the Blackwater National Wildlife Refuge, and finishes with a 26.2 mile run. At Camden Yards Sports Complex another annual test of endurance took place where Maryland Sports supported partner Corrigan Sports with The Baltimore Running Festival. More than 24,000 runners spanning all 50 states and 29 different countries took the streets of Charm City for the festival that included a marathon, half marathon, and a Team Relay. Just over 100 yards from the races finish, M&T Bank a Big 10 football matchup between Maryland and Penn State, which grossed over $6.5 million in direct spending. The two teams met for the second time in 21 years surprisingly as the series tracks back all the way to 1917. October also featured two events for equestrian fanatics: Maryland State Sport was represented in the National Jousting Championship in Frederick County and the Dutta Corp Fair Hill International. Dutta Corp Fair Hill International in Cecil County attracted over 15,000 people and the competitors represented 24 different states and 4 different countries. In November, TEAM Maryland and partner Washington County supported the 54th Annual JFK 50 Mile. This colossal run also included a Military team competition, where the first five finishers of the same military branch had their combined times tallied with the lowest total taking home the coveted “Kennedy Cup”. Later that month, TEAM Maryland supported the groundbreaking of Calvert Regional Park in Cecil County. The massive complex has 10 fields: 9 natural grass and 1 turf field, and has the potential to hold tournaments and games for field hockey, lacrosse, soccer, and ultimate Frisbee. Finally, in the final month of 2015, Maryland Sports partner Elite Tournaments put on a very unique tournament called the Tottenham Hotspur America Trophy. During the tournament, the Tottenham Techincal Staff monitored the games and selected 16 players to take part in a 5 Day UK Player Development Residential Program. Near the holidays in Wicomico County, the 2015 Governor’s Challenge Basketball tournament took place and was extremely successful as it was the largest holiday basketball tournament on the East Coast and the second largest in the country. Maryland Sports helped execute another basketball event in December as well, where they brought University of Maryland to play a game in Baltimore for the first time since 1999. The game against Princeton was played at the Royal Farms Arena in front of a nearly sold out crowd, the game finished Maryland 82- 61 Princeton. The Office of Sports Marketing would be rebranded as “Maryland Sports”. This would entail creating a new website, social media channels, brand guidelines and a new logo. Along with the new re-branding of the office, the Mid-Atlantic Amateur Sports Alliance (MAASA) was developed, and TEAM Maryland would add Worcester County to their partnering counties. Studies and grants for the amateur sports community including economic, direct spending and sports tourism that would help facilitate more sport play in the state. The Colonial Athletic Association brought college basketball and the thrill of tournament play to Baltimore in March 2014, drawing nearly 20,000 fans. The tournament is committed to the Baltimore Arena for at least three years. Maryland Sports worked with a regional coalition to support Washington DC 2024, the Olympic Games Bid. Maryland successfully hosted the International Crown, ICF Canoe Slalom World Championships, Ohio State-Navy, Army-Navy Football Game and 10K Across the Bay. The Sports Marketing Office would move into the Maryland Stadium Authority Offices as it would continue to grow and impact sport in the State of Maryland. With this addition to change in offices, the Executive Director would be elected as the Chairman of the National Association of Sports Commissions. At this time the MSA, DBED and the Maryland Sports commissioned a study to establish benchmarks and guidelines for determining economic impact in the State of Maryland. Along with new sporting events coming to the State of Maryland, new Pilot programs were conducted by legislation in granting Wicomico County to generate tourist dollars for involvement in events and activities. With the involvement of the Eastern Shore jurisdictions; Ocean City and Wicomico County, they would develop a partnership, with grant from legislature; to market their joint sports facilities and hospitality assets. In addition, the first Military Bowl was held in Annapolis, Maryland. It was great success, both in attendance (30,163) and economic impact ($ 1 million.) The bowl game, presented by Northrup-Grumman, is committed to Annapolis for another five years. OSM assisted marketing efforts to expand existing Maryland-based tournaments, such as the Columbia Invitational, an elite soccer club event. The Columbia Invitational, sanctioned by the national governing body, grew from 325 teams in 2011 to 500 teams throughout the mid-Atlantic region over the 2012 Memorial Day weekend. The governing body for the new Olympic sport of BMX held the East Coast Nationals at Chesapeake BMX in Severn, June 14-16, 2013. This is a major qualifier for national ranking, and is expected to draw a large field of competitors. Along with the BMX Nationals, the CAA event was awarded resulting in a 6.5 million dollar economic impact, with 500,000 in tax revenue and 5,500 in hotel rooms annually. This great progression made by the Office of Sports Marketing would impact our Executive Director as he was elected to the Maryland Tourism Council Board of Directors. The Office of Sports Marketing had a successful year building on past initiatives. TEAM Maryland, the partnership established with local marketing bureaus, grew by 30% with the addition of the Town of Ocean City, Charles, Garrett and Baltimore Counties. Along with the added counties TEAM Maryland also introduced and developed a Resource Center. The added incentive to membership included an enhanced presence on the Sports Marketing website, membership in the National Association of Sports Commissions, and the opportunity to participate in industry trade shows. This helped in recognizing the Maryland region as an international sports destination. OSM was instrumental in bringing the popular Dew Tour back to Maryland. Ongoing discussions with Dew officials determined they were looking for an East Coast beach resort, so our Executive Director arranged a meeting with Ocean City. The result was a record-setting weekend for Dew attendance. 73,000+ at the gate also translated into a 7% bump in visitors to the town and significant sales increases in the retail and hospitality sectors. Also, contributing to the host city’s long-range benefit were the four hours of live NBC coverage and a week of front page visibility on the Dew website –– all featuring views of the boardwalk and surrounding landmarks. Ocean City also received advertising time during the live coverage, allowing Rodney the Lifeguard to make his pitch to a national audience. This high-profile will have success in future years as it would return to the beach venue, with attendance increasing every year to a record 105,000 in 2014. The help generated by the E.D. would catch the attention of Baltimore Business Journal who selected our ED to be included in their segment “Power 20: The Next Generation. In 2010, a 501(c) 3 was certified for the Maryland Sports Council and TEAM Maryland, to evolve the Office of Sports Marketing from a government entity to a public-private partnership with the ability to forge corporate sponsorships and more effectively promote Maryland's facilities. This would later result in joining with 10 separate partners associated with TEAM Maryland. In the first two years of creation, One Billion dollars of economic recruitment had evolved with $350 million of that exclusively for Maryland. The Office of Sports Marketing began and ended 2010 on the stage of international soccer. In January, the USA Bid Committee selected 18 cities as potential venues for a future World Cup. The Office of Sports Marketing coordinated bids for both M&T Bank Stadium and FedEx Field and both Maryland venues were among the 18. Throughout the year, OSM continued to bolster support for the USA bid while the nation was gripped with World Cup fever, by promoting a large public watch party at the Inner Harbor to facilitate another successful international match at M&T Bank Stadium. Although the USA was unsuccessful in its efforts to bring the tournaments here, Maryland benefitted greatly from the international exposure and relationships developed over the 18 month bid process. 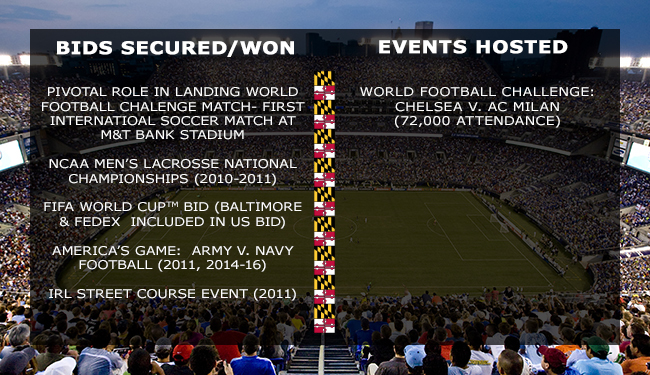 In 2010, the Office of Sports Marketing successfully coordinated bids for a number of future events, including a regional youth soccer tournament in 2013, the 2014 NCAA Men’s Lacrosse Championship Tournament, 2014 Navy-Ohio State football game, 2013 USATF Masters Indoor Track Meet in Prince George’s County and the 2012 USATF Junior Olympics Bid at Morgan State University. The Office of Sports Marketing website, with its daily update on events, facilities and social media, continued to gain followers and document the dynamic industry that is Maryland sports and recreation. In 2010, it averaged 141,000 hits a month. Along with the following of numerous individuals on our social media and events, our Executive Director was named Influential Marylander by the Maryland Daily Record. The Office of Sports Marketing was responsible for orchestrating bids for events that represent in excess of $125 million in additional spending in Maryland. Working with the Baltimore Ravens and City of Baltimore, the Office of Sports Marketing successfully bid to bring the Men’s NCAA Lacrosse Championship back to Baltimore in 2010 and 2011. This Memorial Day Weekend tradition had been held here three times previously, with an estimated $18-22 million economic impact for each championship. OSM also coordinated the partnership for successful bids for the 2014 and 2016 Army-Navy football games. This American classic is estimated to have a $20-25 million economic impact over that designated weekend, creating 425 fulltime equivalent Full-Time Equivalent jobs. With the cooperation of the Ravens and the help of local soccer advocates, they were able to secure one of the first-ever World Football Challenge matches, between Chelsea FC and AC Milan, on July 24th. Not only did the 71,000+ capacity stadium sell out on a Friday night, a significant portion of the crowd came from out of state and stayed overnight and longer. The economic impact of that event was calculated at $20 million. OSM developed the bid package for Maryland venues to participate as part of a future FIFA World Cup Soccer series in the U.S. In January 2010, Baltimore was selected as one of 18 sites included in the USA bid. OSM also took the lead with Baltimore Racing Development to bring an Indy Car race to the streets of Baltimore between the stadium complex and Inner Harbor. A preliminary feasibility study estimated economic impact of $60 – $75 million with 900 FTE jobs. With the development of a new website and social media platforms the Here to Play brand was established in furthering sport in the State of Maryland. The creation of multiple partnerships across the state with county tourism marketing officers, local recreation departments, college facilities and programs and state agencies helped keep venues and services related to sport tourism prominent for the years to come. By marketing materials for each jurisdiction a “One State” theme was introduced, this would further relegate communication outlets to build relationships with present and future stakeholders. Furthermore, engaging with rights-holders, event planners, state and local elected officials and department heads sought out new opportunities for OSM to shift into a powerful name for sports in Maryland. Participation at TEAMS conference with partners, and conducting hundreds of interviews with rights holders and event promoters, interested numerous individuals for Maryland as a destination entity. In 2008, the Maryland Stadium Authority (MSA) partnered with the Department of Business and Economic Development (DBED) (now Commerce) to develop a marketing strategy to attract regional, national and international sporting events to the state for sports and recreational activities. This initiative was prompted by a finding in Governor O’Malley’s transition report that Maryland should be more aggressive in pursuing this lucrative industry to better utilize the state’s athletic facilities and natural resources. At the request of Chairman Frederick W. Puddester, the Maryland General Assembly approved, language permitting MSA to fund such a study and recommend how best to achieve these goals. The State of Maryland had already invested millions of dollars in sports and recreational facilities, maximizing their use to increase revenues was a good fiscal policy. With the ocean, bay, rivers, mountains, trails, and championship golf courses located in a compact geographic region, Maryland has a wealth of attractions to offer. Marketing our resources enhances the visitor industry, a significant portion of the Maryland economy. The initial partnership between the Maryland Stadium Authority and the Department of Business and Economic Development, led to the formation of the Office of Sports Marketing, led by Terry Hasseltine. Its mission is to enhance Maryland’s economy, image and quality of life through the attraction, promotion, retention and development of regional, national and international sporting events. Throughout this effort, the assets and appeal of Maryland as a destination for sports are showcased to millions of spectators and visitors.